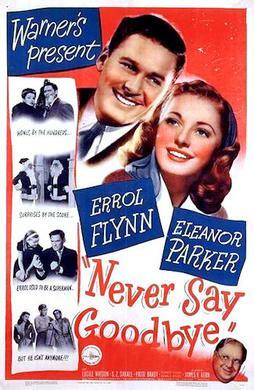 The opening moments of James V. Kern's Never Say Goodbye shows Ellen (Eleanor Parker) and Phil Gayley (Errol Flynn) both separately buying a coat for their daughter Flip (Patti Brady). She buys a modest coat for Flip while he gets a flashier one. This establishes who the two of them are as parents. Oh, and it's worth mentioning that Ellen and Phil are divorced. (The reason as to why their marriage ended isn't specified though Phil's wandering eye might have something to do with it.) As part of their settlement, Flip lives with Phil for half of the year and then with Ellen for the other half. This isn't an ideal situation for Flip so she tries to get her parents back together. But will she succeed? Never Say Goodbye is predictable in spots but as Flynn showed previously with Four's a Crowd, he was just adept at comedy as he was with swashbuckler pictures. (Parker, in turn, serves as a sort of straight woman to the film's antics.) It's not the usual fare for its leads but they're enjoyable nonetheless. In 1958, James Stewart and Kim Novak teamed up for Vertigo, With his traditional ways and her allure, they made for an ideal pairing for Alfred Hitchcock. But did you know that the two actors were in another film that year? 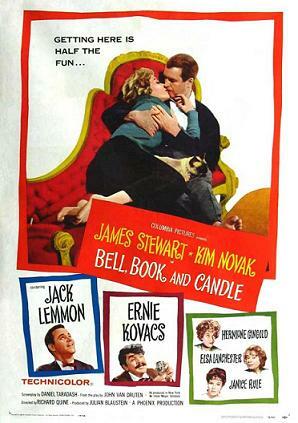 That film for the record was Richard Quine's Bell, Book and Candle, and their roles here were actually similar to those in Hitchcock's. Stewart's Shep Henderson is your average Joe: good-paying job, quiet life, plans to get married. All of that goes right out the window when he crosses paths with the (literally) bewitching Gillian Holroyd (Novak). Obviously, Bell, Book and Candle and Vertigo are two completely different films (the former a supernatural comedy, the latter a thriller). But aside from their lead stars, there are some similarities between the projects, the most telling being Stewart getting drawn to Novak's aloof nature. Alongside Stewart and Novak in Bell, Book and Candle are the likes of Elsa Lanchester and Jack Lemmon, both as members of Gillian's family (she as her aunt, he as her brother). Obviously it's interesting casting (Lemmon in particular sports one hell of a manic grin most of the time) but of course this show belongs to Stewart and Novak. It's made clear early on in Don Hartman's Holiday Affair that Connie Ennis (Janet Leigh) has a lot on her plate. A war widow with a young son, her longtime suitor Carl Davis (Wendell Corey) has recently proposed to her. But things get more complicated when Steve Mason (Robert Mitchum) enters her life. Admittedly lighthearted fare like Holiday Affair was typical for Leigh at this early stage of her career. But this was decidedly a change of pace for Mitchum, having recently been released from jail for marijuana possession. (His casting was a deliberate move on RKO head Howard Hughes' part.) And it was a good opportunity for Mitchum to move beyond his usual "baby, I don't care" image. Upon its release, Holiday Affair wasn't much of a hit (though subsequent showings on TV have vindicated it in later years). But why wasn't it successful? It was released at a good time (read: the holiday season), its leads were generally bankable (though more in the years to come for Leigh), and the premise was easy to follow. Maybe it wasn't promoted properly but we may not know for sure. Anyway, Holiday Affair is an enjoyable little yarn despite its overall predictability. Leigh and Mitchum connect very well in their scenes, almost making one wish they had done another project together. With her at the start of her career and him being a recent Oscar nominee, there was nowhere to go but up for the both of them. 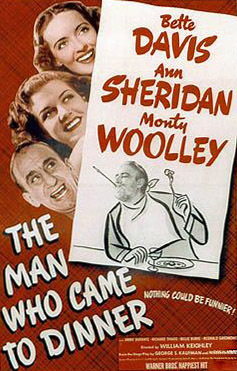 The minute radio personality Sheridan Whiteside (Monty Woolley) opens his mouth in William Keighley's The Man Who Came to Dinner, his disdain for, well, everything knows no bounds. And after he breaks his hip, his caustic tongue doesn't take it easy like the rest of him. God help those who cross both him and his path. Now Keighley had various ups and downs as a director prior to making The Man Who Came to Dinner. (He worked at Warner Bros. so he had worked with the likes of Davis, James Cagney, and Errol Flynn.) It's more than likely that the higher-ups had some doubts on the director as a whole (film critic David Thomson certainly thinks so) but that doesn't reduce the worth of his many films. The Man Who Came to Dinner is a breezy comedy of manners, its release being at perhaps an ideal time. (The attack on Pearl Harbor was only the month before.) If the following years proved anything, Woolley was more than warmly welcomed to Hollywood as a result of his work here.